Such are the tips gleaned from Anthony Bourdain, the chef and TV host, when he was visiting Vietnam. His show, “No Reservations,’’ has left its mark on international eating. Squatting on small plastic chairs, in fluorescent-lighted night markets, and outside butcher shops, he chows down on whatever the locals favor. In Vietnam, that means banh mi. Following in Bourdain’s footsteps last April, I found myself perched on a tiny plastic stool, outside a textile market in the coastal city of Hoi An. There was the woman, right where he said she’d be. She worked in a little glassed-in cart, a single light bulb illuminating bowls of fatty head cheese, and julienned vegetables tangy from an overnight soak in sweetened vinegar. She plucked greens from a pile of verdant cilantro and used a 10-inch knife to smear waxy yellow mayonnaise on baguettes. Vietnamese banh mi sandwiches are a culinary collision of cultures. A crusty French baguette, slathered with mayonnaise (French again) and pate (more French), along with head cheese and ham, is topped off with fresh Vietnamese flavors: cucumbers, pickled carrots, daikon, and cilantro. Sometimes a dash of Asian fish sauce or soy sauce gives an extra umami boost; other times, a handful of Thai chili peppers brings the heat. From the woman in Hoi An, you could ask for the deluxe and a sizzling fried egg came on top. The result is crisp, fresh, salty, and bright. Cost: 77 cents. Finding excellent banh mi in Boston means heading to Banh Mi Ba Le in Dorchester, where Jennifer Nguyen, 49, assembles the sandwiches. Nguyen grew up on a US and South Vietnamese Army base in Nha Trang. Her grandfather ran the base restaurant. Six years after the last US Marines left Saigon in 1975, Nguyen’s family escaped on a ship headed to Hong Kong. It was a dangerous crossing: “Ten family members go,’’ says Nguyen. “When they get there, one left.’’ At the end of Nguyen’s journey, a storm struck; a fishing boat eventually found the wayward vessel. The family came to Massachusetts one year later. She was 24. 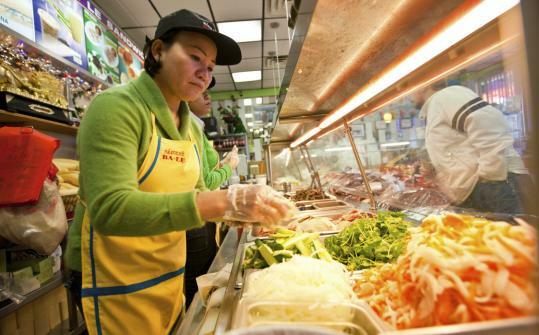 Nguyen’s sister originally opened Banh Mi Ba Le in 1996; Nguyen took over four years later. In the beginning, the shop sold 100 baguettes a day. A Frenchman, a friend of a friend, taught her traditional baking techniques. Nguyen has raised four children. She arrives at the shop at 4 a.m., seven days a week, goes home to Quincy at noon for a quick nap, then returns, working until 10 p.m. each evening. Banh mi ($3) are still made with freshly baked bread; the shop sells up to 1,000 baguettes a weekend. In September, Nguyen was given an award for her work in the community. For the past 10 years she has donated food and raised money for afterschool programs that celebrate Vietnamese culture and language. “When you live in this country, you have everything. I try to be strong and support my children. I’m very lucky,’’ she says. Her cooking is a reflection of her life’s travels, says Nguyen. “I learn by eating, I figure out, I ask about flavors.’’ Banh mi is served on a fresh baguette, piled high with head cheese, ham, and ham hocks. The mayonnaise is homemade, as are the pickled vegetables. You can also get barbecue banh mi, a favorite of her countrymen; or fried tofu banh mi, served with all the traditional fixings. The modern banh mi reflects yet another culture joining the collision. Banh Mi Ba Le, 1052 Dorchester Ave., Dorchester. 617-265-7171. Hannah Crowley can be reached at hhc.crowley@gmail.com.